At Atsalis Dental Excellence, our team offers a friendly and comfortable atmosphere where patients who are struggling with dental problems can know right away that they’re in good hands. Dr. Atsalis is capable of correcting a wide variety of dental problems with restorative care, from a simple, small cavity to advanced matters like severe tooth loss and oral pain. Our goal is to help you get back to enjoying your best smile as soon as possible! Don’t wait if you’re struggling with damage – contact our Plymouth office right away to schedule a visit. 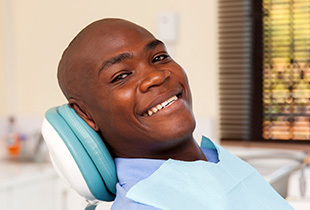 If you have one or more damaged teeth, a custom-made restoration from our dental practice can help you get back to enjoying your smile as it should be. 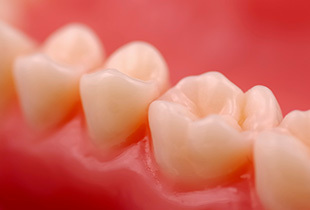 Dental crowns can repair and protect individual teeth, while bridges are meant to restore empty gaps. 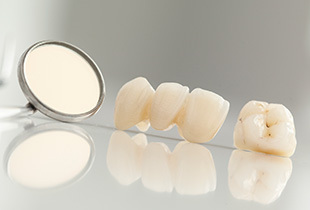 These restorations are lifelike, durable, and precisely customized for the right fit. Tooth-colored fillings are a worthwhile replacement for traditional amalgam, and they’re capable of treating cavities and restoring your smile’s health in a beautifully natural way. Dr. Atsalis uses high-quality, flexible composite resin that comes in a variety of different shades so that we can find the most precise match to your enamel. If you’re ready to replace missing teeth, there isn’t a better option in the world of dentistry today than dental implants! Implants seamlessly recreate every part of your natural tooth, instilling new oral strength, attractiveness, health, and longevity. In fact, they’re likely to last for the rest of your life as long as they’re cared for properly. Your natural teeth are composed of several distinct layers, leading down to a vulnerable inner pulp. When infection or a traumatic injury allows harmful bacteria to reach this crucial layer, it can create extreme sensitivity and pain for patients, leading to the need for extraction. Thankfully, root canal therapy may be able to circumvent the damage and help you save your tooth. During this procedure, Dr. Atsalis will access the inner canals and remove all of the damaged pulp from them, thoroughly cleaning the area in order to minimize the risk of further infection. As a final step, our team will create a custom-made restoration that covers the treated tooth and recreates its shape. 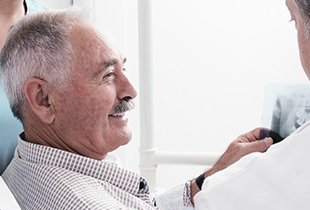 If you’re missing a significant number (or even all) of your natural teeth, a custom-made denture from Atsalis Dental Excellence can provide you with the reliable and affordable replacement you need. Our modern prosthetics are designed to be comfortable, form-fitting, and lifelike in nature, and they’re removable as well so that they can be conveniently cleaned and stored. 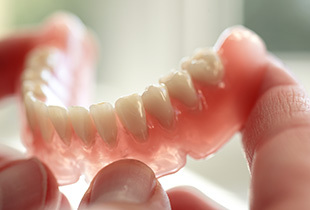 If a patient is looking for extra permanence and stability, implant-retained dentures are also available at our Plymouth office. During this procedure, patients can trust our team to help them remain calm and comfortable. If needed, we will start working with you right away in order to determine the best possible tooth replacement. We don’t want you to be without your full, confident smile any longer than necessary!